In the year 2000, I was the surprised honoree of an annual award launched by Longwoods Publishing in association with IHPME at the University of Toronto and HP Canada. 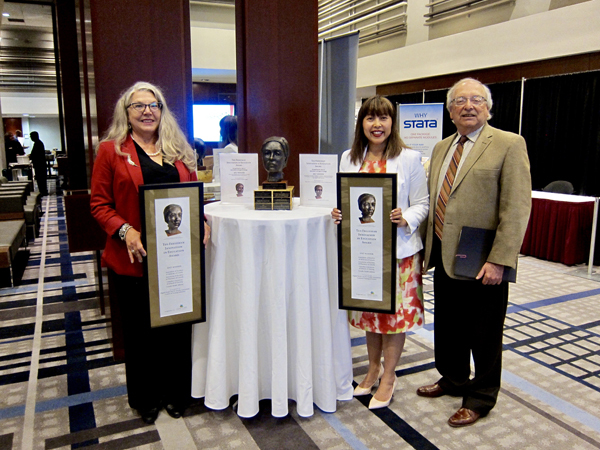 The Ted Freedman Award for Innovation in Education (https://www.longwoods.com/pages/tf-award) is given annually to individuals and organizations that inspire, advocate and enable education in health, health services and healthcare management. We believe there is a close association between research and innovation in education. This is a wide-open international competition. Anyone or any group can submit. 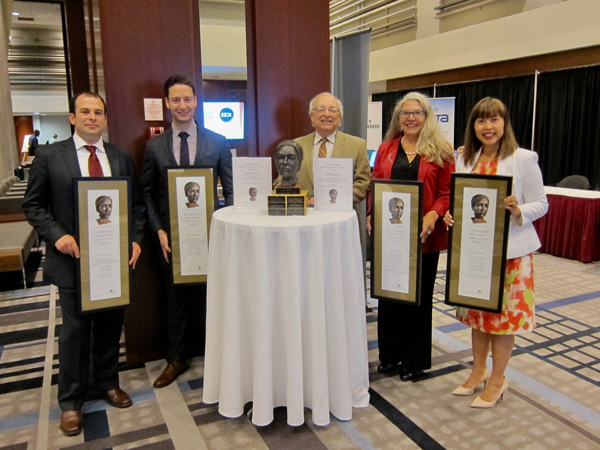 The winners are honoured with certificates and a self-portrait in bronze of the artist as a patient recovering from brain surgery, by award-winning sculptor Amy Switzer of Barrie, ON. This year, 2017, we received an exceptionally strong group of applicants making it very difficult to narrow it down to one winner. So, for the first time in the history of this award, we have a tie. 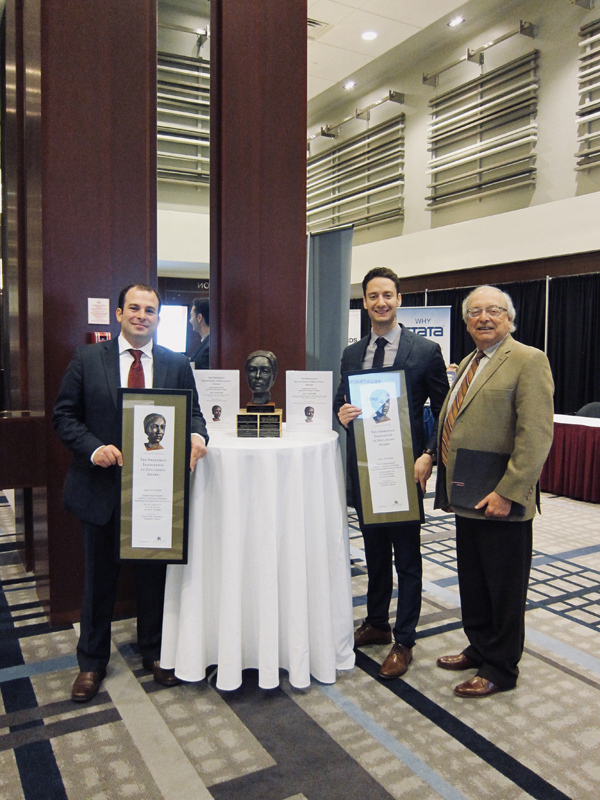 Congratulations to both winners, who were awarded their certificates at the 2017 CAHSPR Conference in Toronto, ON. The winners are Just-in-Time Procedural Simulation Program from the Departments of General Internal Medicine at Mount Sinai Hospital and the University of Toronto, and the Digital Health Faculty Associations Content & Training Solutions (FACTS) Program from a collaborative including the Association of Faculties of Medicine, Association of Faculties of Pharmacy, Canadian Association of Schools of Nursing and Canada Health Infoway. You can read about these programs here. We also have descriptions of a few of the other submissions that were received. Feel free to contact the appropriate representative if you have more questions about these intriguing programs. And maybe next year, you'll be ready to share the results of a program you have been working on. Fall is a time of colour and change – 'back to school' jingles are often heard and students and educators look forward to new classrooms, curriculum and academic experiences. This year was no exception for the Digital Health Faculty Associations Content & Training Solutions (FACTS) program. With renewed vigor due to the 2017 Ted Freedman Award (https://www.longwoods.com/pages/ted-freedman-award-history), this national collaborative – consisting of Canada Health Infoway, the Association of Faculties of Medicine of Canada (AFMC), the Association of Faculties of Pharmacy of Canada (AFPC), and the Canadian Association of Schools of Nursing (CASN) – has been busy planning the next phase of the program. Susan Sepa and Anne Fazzalari with Ted Freedman. It has been a six-year journey for Digital Health FACTS, a program that has integrated Canadian informatics competencies in undergraduate medical, nursing and pharmacy curricula across the country. Patient or 'consumer' health resources have also been developed to support educators and students in the ever-changing landscape of digital health in the 17 Faculties of Medicine, 10 Faculties of Pharmacy and 94 Schools of Nursing in Canada. Leveraging a successful peer-to-peer engagement model (https://www.infoway-inforoute.ca/en/communities/clinician-peer-network) and a national change management framework (https://www.infoway-inforoute.ca/en/resource-centre/toolkits/change-management), the program also created faculty networking and change leadership opportunities for educators to connect with their colleagues, sharing stories of how they integrate digital health into their teaching activities and courses. In addition, 'organic' dialogue and discussion emerged from this initiative, in the form of a student-organized, interprofessional Symposium, focused on the role of digital health in education and its contribution to better patient care. To date, nine successful projects have been completed within the program whereby approximately 40 Faculty Peer Leaders have engaged over 9,700 of their educator colleagues. With the foundation for this unique, interprofessional "people project" established, the next phase will see teaching/learning resources developed for electronic prescribing, contributing to safer and more effective medication management. So as leaves are changing this fall and we turn our attention to "back to school," look for more information on the Digital Health FACTS program, which continues to create useful resources to support faculty in educating the next generation of clinicians to practice in the digital health age. For more information, visit https://www.infoway-inforoute.ca/en/our-partners/clinicians-and-the-health-care-community/faculty-peer-network-program. Mount Sinai Hospital's and the University of Toronto's Departments of General Internal Medicine have partnered to create the Just-In-Time Procedural Simulation Program, a novel quality improvement initiative developed to improve both medical education as well as physician proficiency in common hospital-based procedures. Luke Devine and Eric Kaplovitch with Ted Freedman. While mastery of bedside procedural skills has long been an essential competency in postgraduate medical training, and an integral component to safe medical practice, it has recently been identified as a skill in need of improvement. To address these deficiencies, the Just-In-Time Simulation Program was created as a comprehensive, ubiquitously-available training inititiative. It is comprised of self-directed, interactive teaching modules in paracentesis, thoracentesis, and lumbar puncture: commonly urgent procedures that are currently associated with documented practitioner discomfort. With Just-In-Time Simulation, trainees and physicians at all levels can access concise, instructional computer modules that outline materials, indications and contraindications, suggestions for investigations, as well as video-guided, step-by-step instructions for these procedures based on existing best practices. After reviewing the modules, trainees can practice their hands-on skills with live simulation on ultrasound-compatible models, available within a centre accessible 24-hours per day. Pre-filled consent sheets, standardized procedure checklists, and documentation notes are then automatically printed to ensure quality of patient care. The result is a novel 'one-stop' method of teaching procedural competencies to medical practitioners and ensuring safe, evidence-based procedural performance. To date, the Just-In-Time Simulation Program has facilitated over 1,200 simulation sessions, with over 2,700 page views of content. The majority of utilization takes place outside of business hours, during which time medical trainees often have less direct oversight from supervisors, and can particularly benefit from directed and comprehensive procedural review. While the majority of practitioners utilizing the Just-In-Time initiative have been within the University of Toronto affiliated academic centres, online analytics have demonstrated a wider usage base, including use by practitioners in multiple cities across Ontario and Quebec. The Just-In-Time Procedural Simulation Program continues to grow, striving to both improve medical education and make bedside procedures safer. Mobile compatible modules have recently been launched and there is scheduled expansion to other procedures in the coming year, including arthrocentesis and central venous catheter insertion. For more information, visit https://www.sinaihealthsystem.ca/news/simulation-centre-offers-just-time-training-residents/. 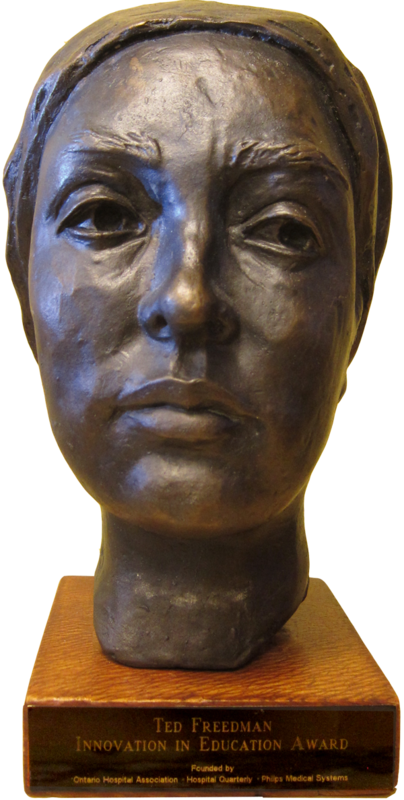 The Ted Freedman Award for Innovation in Education: a self-portrait in bronze of the artist as a patient recovering from brain surgery, by award-winning sculptor Amy Switzer. The Iranian District Health Management Training Program (IDHM_TP) was developed to build the managerial capacity of district health managers in Iran based on management framework in the Iranian healthcare system. The district health management framework contains five strategic foundations namely: leadership, organizational culture, organizational design, political context and intersectoral collaboration and community participation. Also six building blocks: human resources, financing, resources generation, performance management, information technology and infrastructures, were considered the structural parts of the district health management framework. Strategic goals of district health management: equity, responsibility, safety and quality, accessibility, financial protection, and chronic care management, were considered to provide integrated services. The District Health Management training program consisted of 11 modules with 54 educational topics. The program indicated that district management, quality improvement, health information management and situation analysis, planning and evaluation, research in health systems, community participation, health resources management, management and leadership, as well as rules and ethics were essential and important managerial courses. Trainees are satisfied with the courses, different teaching methods and improvement in their knowledge about health system management competencies. However, continuous supervision and managerial support is necessary to improve the effectiveness of training courses. For more information, please e-mail Dr. Kamal Gholipour at kqolipour@gmail.com. Getting clinical value from your electronic medical record (EMR) requires more than simply adopting the technology. Physician practices using EMRs to maintain patient records and connect to information systems across the healthcare system need to ensure they are constantly learning, to realize their EMR's potential to enhance patient care and improve office efficiency. That is what makes OntarioMD's EMR: Every Step Conference series such an important event. For the past five years, day-long EMR: Every Step Conferences have offered clinicians across Ontario a unique opportunity to gather and learn about what is new in the world of certified EMRs. Attendees can participate in educational seminars, visit EMR vendors to learn how to use the latest features, and network with other EMR users. The EMR: Every Step Conferences are Canada's largest EMR conference series. They have been certified as a group learning program by the College of Family Physicians of Canada's Ontario Chapter for up to 7.5 Mainpro+ credits (transferrable for specialists). More than 3,000 clinicians have attended the conferences over the years, in Toronto, Ottawa and London, Ontario. The focus and learning opportunities presented have shifted over the years, as the number of family doctors using EMRs has grown and their needs have evolved. With more than 14,000 community-based physicians now connected to an EMR, the conference has become an important venue to share ideas of how to conduct efficient searches and use more advanced EMR features. OntarioMD is committed to ensuring that the EMR: Every Step Conference provides EMR-connected clinicians with the information they need to increase clinical value through the power of digital health. For more information, please visit www.ontariomd.ca. The COACH Core Health Informatics (HI) Education program launched in 2013 with the goal of preparing HI professionals for the Certified Professional in Healthcare Information Management and Systems – Canada (CPHIMS-CA) exam. Today, member demand for access to the HI body of knowledge captured in the course material has sparked an expansion of both content and scope. Innovation is at the heart of the COACH HI Education program. It is the first cross-disciplinary program to be developed with volunteer HI experts and leaders operating in a variety of professional settings; healthcare organizations, provincial/national government agencies, vendors, consultants, and academia. Experts develop the curriculum and deliver the final product in-person or on-line, with each module presented by a Canadian HI professional with subject matter expertise. COACH HI Education has been delivered to individuals from more than 90 organizations across Canada. More than 500 healthcare, IT and management professionals have participated, representing more than 6,500 educational hours. In addition to exam preparation, COACH educates clinicians just entering the technology space, IT specialists moving into healthcare, entrepreneurs solving complex challenges in digital health, and seasoned healthcare professionals interested in expanding their knowledge base. Health Informatics professional education is vital to the evolution of a dynamic healthcare system, and COACH Core HI Education is continuously updated to reflect changes in the eHealth/digital space. And there is more expert volunteer innovation still to come in the form of a collaborative academic partnership that will see the program migrate to an e-learning environment: another cost-effective and efficient way to deliver education in a field where accelerating knowledge is foremost for organizational transformation and innovation. For more information, please e-mail education@coachorg.com or visit coachorg.com. Since 2012, North York General Hospital (NYGH) has embarked on a journey to grow and sustain a culture of Patient- and Family-Centred Care (PFCC) as a central aspect of its strategic plan. A key component for success has been the development and sustainability of ongoing education for staff, physicians, and volunteers in the principles and practices of PFCC. Beginning in 2014, NYGH's Organizational Development team partnered with patients and families to create an interactive and innovative PFCC education program for staff, physicians, and volunteers. Through a patient engagement process of in-person meetings, a four-hour session was created to pilot with the leadership team. Four key elements most effectively helped participants translate knowledge into practice: storytelling, understanding core principles, simulation exercises, and identifying one's role in doing PFCC. To achieve greater sustainability of delivery and spread of the program, these elements were condensed into a two-hour session that was integrated into New Employee Orientation and delivered as workshops for current staff. Since 2014, over 1500 staff, physicians and volunteers have completed the education session. The success of NYGH's innovative PFCC education is clearly demonstrated in employee engagement survey results that reveal the increased capacity and ability of staff and physicians to deliver PFCC in the hospital. NYGH has learned that in order for PFCC to be effectively integrated into culture and practice, it begins with designing patient-centred education that builds the capacity and efficacy of current and future staff to deliver consistent PFCC across the organization. For more information, please e-mail Jennifer Quaglietta at Jennifer.Quaglietta@nygh.on.ca. From left to right: Luke Devine, Eric Kaplovitch, Ted Freedman, Susan Sepa and Anne Fazzalari.